Posted on September 3, 2009, by mleung, under Uncategorized. (Thunder Bay, ON. September 3, 2009) The Conserve the Light conference, which started today at the Valhalla Hotel, has attracted over 200 First Nations leaders, community representatives and Métis to Thunder Bay from across Ontario. This conference is part of the Energy Efficiency & Conservation Measures for Aboriginal Communities (EEMAC) program developed by Charles Fox Consulting Inc. (Thunder Bay) and funded by the Ontario Power Authority. The main goal of the program was to introduce and implement energy efficiency and conservation measures throughout all 134 First Nations communities in Ontario. This program consisted of four main components: the Conserve the Light Gathering conference, Education and Awareness, Energy Conservation Kits, and the Energy Retrofit Pilot. L’honorable George Smitherman, vice-premier ministre et ministre de l’Énergie et de l’Infrastructure, fera une annonce à propos d’initiatives ayant pour but d’aider les communautés de Premières nations et métis qui souhaitent entreprendre des projets d’énergie renouvelable. Les initiatives appuient les principaux objectifs de la Loi sur l’énergie verte, dont développer des sources d’énergie renouvelable, offrir des possibilités aux communautés des Premières nations et métis et encourager le développement économique, notamment dans le Nord de l’Ontario. The Honourable George Smitherman, Deputy Premier and Minister of Energy and Infrastructure will make an announcement about initiatives to assist First Nations and Métis communities interested in renewable energy projects. The initiatives help address key objectives of the Green Energy Act, including developing renewable energy, providing opportunities for First Nations and Métis, and encouraging economic development, including opportunities in northern Ontario. Posted on September 2, 2009, by mleung, under Conserve the Light. (Fort William First Nation/Thunder Bay, ON, September 1, 2009) The Teepees, Sweat and Teaching lodges are now in place on Animiki wadjiw (Mount McKay). Each has been carefully erected in accordance with regional traditions, for the unprecedented gathering of over eighty First Nations and Métis Elders who will discuss how they can protect Mother Earth through energy conservation. These Elders from across Ontario representing a cross section of experiences, backgrounds and home communities begin deliberations and ceremonies today on Animiki wadjiw (Mount McKay to the west of Thunder Bay). This is in preparation for the Conserve the Light conference (http://www.conservethelight.ca), beginning on September 3 until September 4, 2009. Posted on September 1, 2009, by mleung, under Uncategorized. (Two Feathers Forest Products LP, Ontario, Sept.1, 2009) Eagle Lake First Nation received $829,000 from the recent Community Adjustment Fund (CAF) announcement. This will support the Two Feathers Forest Products LP (TFFP) value added initiative. 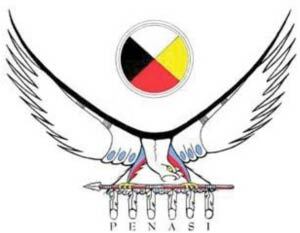 TFFP is a partnership involving Wabigoon Lake Ojibway Nation, Pikangikum First Nation, Eagle Lake First Nation and Finnish based Wood Tech Group. TFFP will develop two value-added forest products processing facilities, one at the Municipality of Red Lake and the other at Eagle Lake First Nation. The Red Lake site will house the primary sawing facility including log sorting, grading, and chipping facilities with a 9.9MW biomass cogeneration plant to generate electricity for sale into the Ontario power grid. Wood processed at the Red Lake site will be trucked to a planer mill at Eagle Lake First Nation for further value adding to specialized components and assembly ready building packages. Posted on August 31, 2009, by mleung, under Uncategorized. We write in response to your letter to Don Staniford, Global Coordinator for the Pure Salmon Campaign, dated August 26, 2009. As you are aware, I was a signatory to that letter in my capacity as Chief of the Kwicksutaineuk Ah-Kwa-Mish First Nation (K-AFN) and Chairman of the Musgamagw-Tsawataineuk Tribal Council (MTTC). I write this letter on behalf of the four Nations of the MTTC. The issues raised in the Pure Salmon Campaign correspondence, both in our original letter to the King of Norway, in which you were copied, and in your response letter, are of the utmost significance and importance to the MTTC membership. We rely on the salmon fisheries for subsistence and cultural survival and as such, we possess constitutionally protected rights to the salmon fisheries in our traditional territories under s. 35 of the Constitution Act. On several previous occasions, we put your Ministry on notice that the salmon stocks we traditionally rely on have not been available in sufficient abundance for us to meet our basic food, social and ceremonial needs. We therefore reviewed your letter closely and have a number of serious concerns with the inadequacy of your response that I am obliged to communicate to you on behalf of the membership. Posted on August 10, 2009, by mleung, under Uncategorized. (July 24, 2009) As part of the ongoing Energy Efficiency & Conservation Measures for Aboriginal Communities (EEMAC) program, Charles Fox Consulting Inc. and the Ontario Power Authority (OPA) will convene a Gathering of Ontario First Nations and Métis Elders and Leadership and community members from September 3, 2009 to September 4, 2009 in Thunder Bay, Ontario. A First Nations energy efficiency conference will be held on September 3 to September 4, 2009. The conference will focus on energy conservation successes, challenges and opportunities in First Nations and Métis Communities in Ontario.